So, when I told V about our participation, he didn’t look excited as he probably thought that I will back out at the last minute. The day before the run, he asked me for the 99th times if I’m for real and my answer is still a firm YES! “Aging woman is afraid of the sun, but that doesn’t mean that I cannot run.” I replied. Luckily, he didn’t see me slapping on SPF sunscreen before we stepped out of the house. Else, he will have another round of laughing. The ‘kan chiong’ spider in me woke up super early yesterday because I dreamt that we couldn’t find a parking space and hence missed the run. So, we left our house at 7:45am, one hour ahead of our reporting time. When we reached the Esplanade at 8:10am, there were ample parking lots. 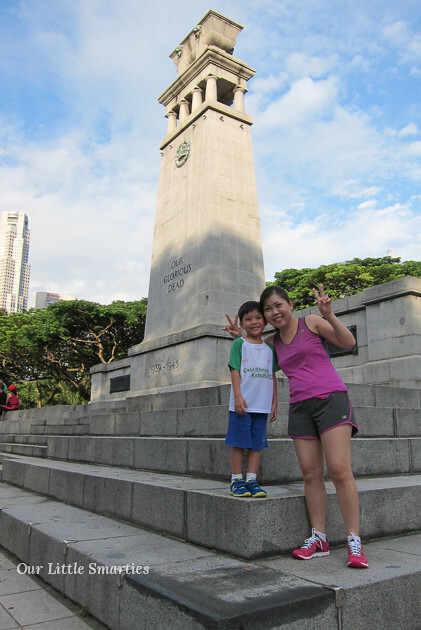 We took a slow walk to The Padang and took some pictures. The atmosphere was awesome. It made me feel like a 7 year-old kid looking forward to my school sports day. Because of the blazing heat, we reported to the holding area early to get some shades. 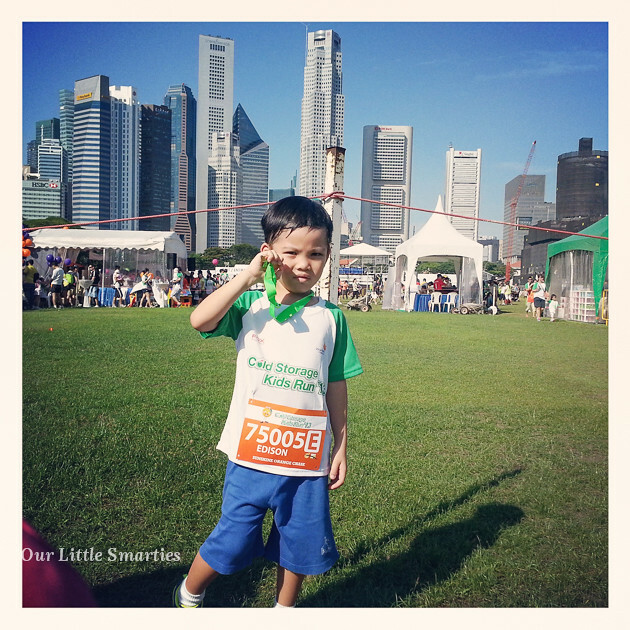 He was in the Sunshine Orange Chase (Fun Run 800m for 5, 6 years old). We were seated in the first row of the holding area and waited for about 20 minutes before we were released to the starting point. Little Edison looked a little tense now due to the long wait. 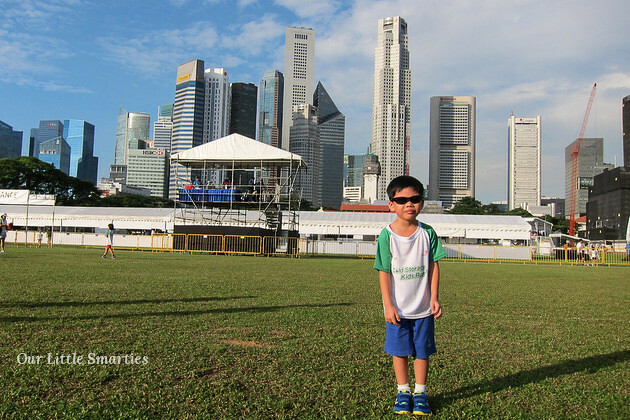 I was so worried that he will ask to go to the toilet five seconds before the flag off time. Thankfully, that didn’t happen. The moment the race started, he took off enthusiastically without even looking back. I ran behind him to make sure he wouldn’t fall, but he was too fast. Believe it or not, this boy can actually run faster than me. Somewhere at the 600m mark, I was screaming “Boy, slow down. Wait for Mama!” He continued to run and reached the ending point ahead of me. Here’s my little champion looking extremely pleased with his first medal ever! He was so proud of it. Despite the crazy heat and sweating like a pig, I really enjoyed myself too. I haven’t been to such run for a long time and I’m glad to be able to run with my son this year. 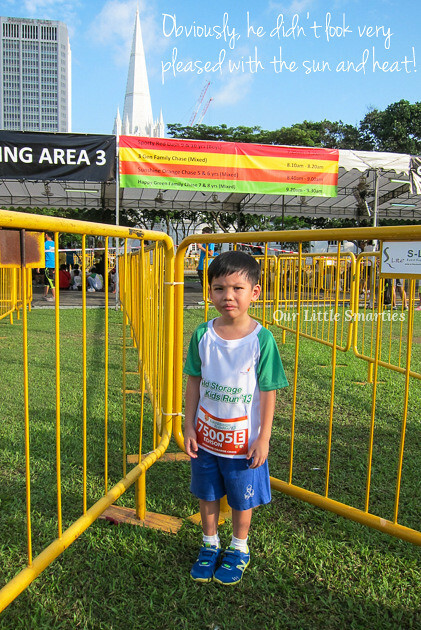 I feel that Cold Storage Kids Run is a very meaningful running event that aims to encourage families to exercise and have a healthy lifestyle. Hopefully after this event, we can continue to run together as a family. As for Little Edison, he couldn’t stop admiring his gold medal for the rest of the day. Looking forward to the run next year! If you’re interested to view more pictures of the event, check out the Kids Run website. 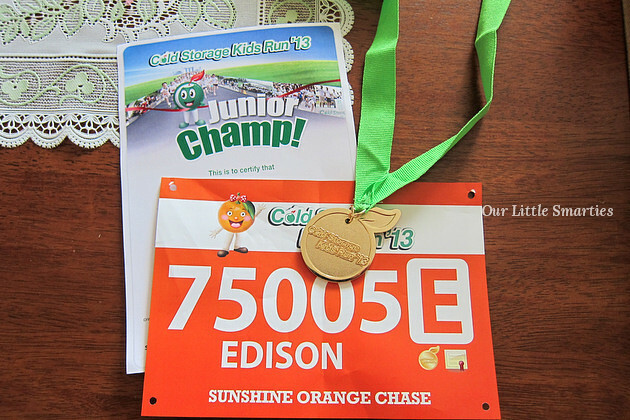 Glad to read that both you and Edison completed the run..good on you!! cheers to both Emily and Edison ! happy run ! It seems really hot and sunny , not necessary a gender bias, but ladies (I) usually don’t like sweating under the Sun except our unconditional support and love to our kids ! It was indeed super duper hot. The amount of sweat I had yesterday is probably more than the amount I had for one week on usual days. Haha! We came back a shade darker, but it was worth for the fun and experience.